It implies that those of us who choose not to buy from certain multinational corporations are prejudiced individuals, so stop being so silly and wishy-washy. I agree with him that organic food and ethical trade should be accessible to all, but also think that trying to effect change from within is a tactic that hardly ever works. Cadbury’s can give them a free reign for now, but G&B’s may eventually just get sucked(/suckered) along with company policy. According to my 2003 copy of The Good Shopping Guide, Cadbury’s has bottom ranking on issues such as environmental reporting, working with/in oppressive regimes, non-publication of a suppliers’ code of conduct and irresponsible advertising. Plus points include decent workers’ rights, and sourcing cocoa from Ghana, which has strict anti-child trafficking policies. For further online reading, Ethical Consumer‘s website has a buyers’ guide to chocolate in PDF form. To be fair to Cadbury’s, they fare better than quite a few other chocolate producers. My other bugbear with Cadbury’s is the near-ruination of my tastebuds as a child; their Dairy Milk bar can hardly be considered chocolate with only 20% cocoa solids. But I’ve since learnt that there are chocolate makers out there who care about taste and where their ingredients come from. For regular snacking, Traidcraft has a growing range of chocolate bars (with the praline being our favourite), and Divine Chocolate has milk and orange chocolate (but does not, as yet, use Fairtrade sugar). If you’re looking for a special treat, you should check out Hotel Chocolat. These guys take chocolate very seriously, and have seasonal changes of their range. We’re still riding on the good impression from giving Hotel Chocolat boxes away as Christmas and birthday pressies. 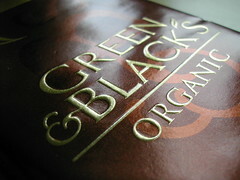 We’re probably going to continue buying G&B’s chocolate bars, but will have to watch out from now that standards do not slip. I’ve had to re-write/link the last two paragraphs because Bloody Blogger cut off the end my post. Getting quite fed up; this happens at least once a week!